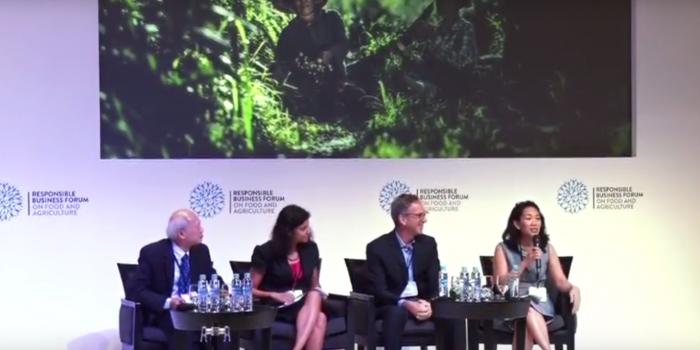 The private sector can play an important role in conservation – that was the message Lucita Jasmin drove home at Conservation Asia 2016. 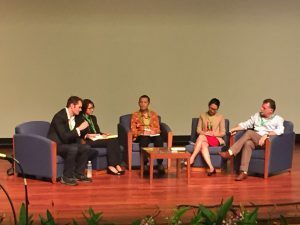 APRIL Group’s Director of Sustainability & External Affairs joined 550 international delegates, comprising scientists, academics, students, industry leaders and policy-makers at the June 29 to July 2 conference at the Stephen Riady Centre, National University of Singapore’s University Town. She spoke on the agro-industry and conservation plenary panel which discussed balancing agro-industrial activities with conservation. 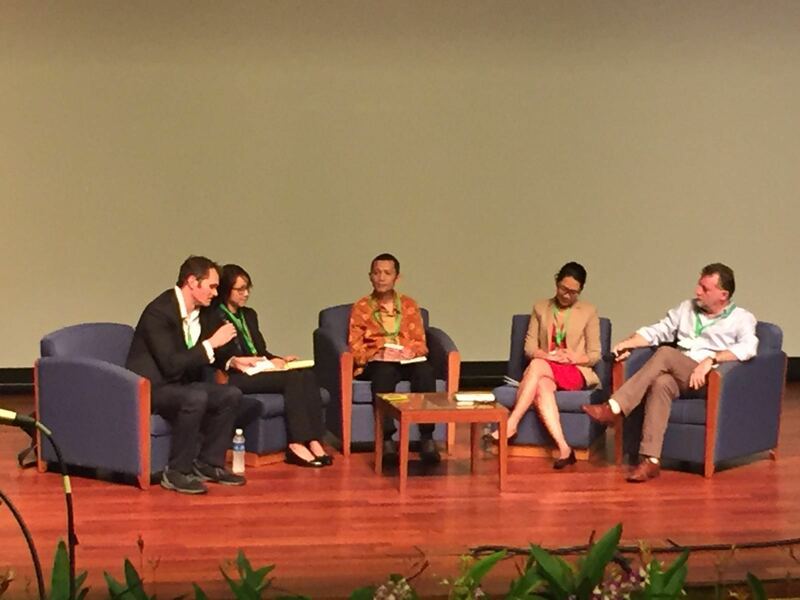 The agro-industry and conservation panel: Rhett Butler (moderator), Janice Lee, Rudi Putra, Lucita Jasmin and Simon Lord. Ms Jasmin touched on the private sector’s role in good governance in conservation, saying the private sector in Indonesia is able to set up systems to protect conservation areas within their operations. Being incrementally embedded in a company’s business, conservation becomes institutionalised and accounted for as natural capital. To help minimise the social and economic pressures on forest resources, the private sector needs to work collaboratively and closely with local communities. She cited programmes aimed at creating alternative sources of livelihood as one of the benefits from these community engagements. The approach to conservation is evolving. We must strengthen the interface between science, conservation, policy and practice. Insights from the panel resonated with APRIL’s work. Fellow panelist Janice Lee pointed out a paradigm shift in the academia: Scientists are moving from measuring negative environmental impacts of agro-industrial companies’ operations to actively working with the private sector on mitigating those impacts. 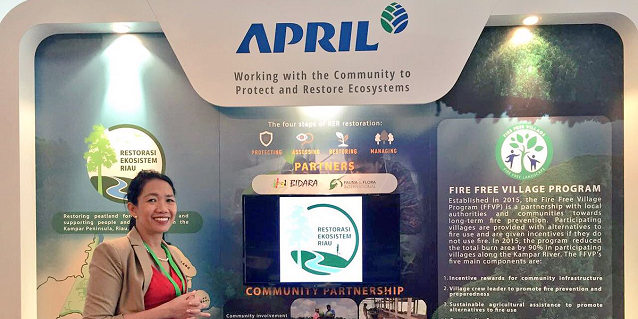 Similarly, APRIL works with peat experts from around the world. 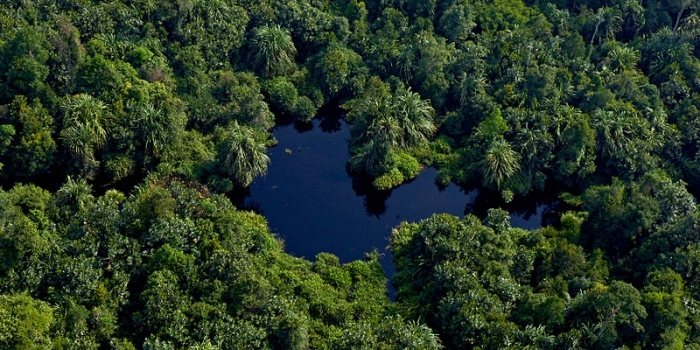 Having helped catalysed the formation of the Independent Peat Expert Working Group (IPEWG) in Jan 21, 2016, APRIL closely consults the group to develop a robust science-based approach to responsible peatland management and reducing greenhouse gas emissions. Moderated by Mr. Rhett Butler, the agro-industry and conservation panel discussion also included Ms. Janice Lee (a scientist from Nanyang Technological University), Mr. Rudi Putra (Leuser Conservation Forum), and Mr. Simon Lord (Sime Darby). Conservation Asia 2016 was jointly hosted by the Society for Conservation Biology (SCB) and the Association for Tropical Biology and Conservation (ATBC), two of the largest international NGOs on biological conservation. It included a variety of plenary panels, symposiums, workshops and lunchtime talks. 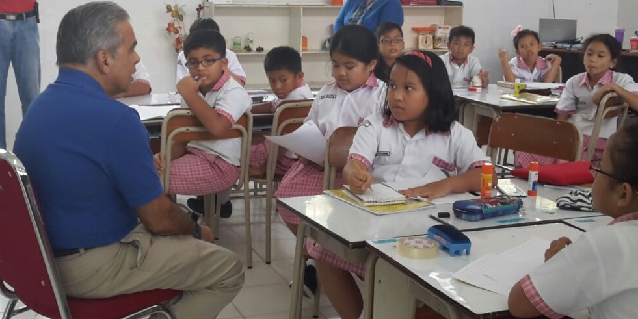 View APRIL’s tweets on Conservation Asia on Storify!